Mo Better Burgers was the former home of OBO Burger and the current incarnation of the well-loved Mo Better Meaty Meat Burgers that once was located at Pico and Fairfax. That's your history lesson, kids. Fat Bruce Lee made a rare appearance and joined me for this review. Parking was free but tight in the mini mall in which Mo Better Burgers was located. My favorite part of getting there was watching a woman of dubious morality dawdling in a crosswalk and loudly asking where she could procure some crack while waving a crumpled handful of legal tender. I was fresh out and sadly unable to be of assistance-but I digress. Fat Bruce Lee and I ordered a couple of burgers at the counter of the small restaurant. We seated ourselves and settled in. Our wait was about 12 minutes. The Seasoning: The burgers were hit with salt and pepper. A little too much, but it wasn't overpowering. The Sear: Meh. 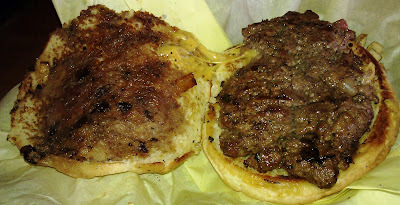 The griddle at Mo Metter Burgers wasn't hot enough, and the burger meat was too wet, to get a good sear onto the beef patties. A solid sear from a hot flat top would have added a dimension to the this burger that could have taken it from good to really good. The Preparation: The burgers were formed on-the-fly using the scoop and smash method. I ordered Medium, and I got Medium Well. The beef was juicy enough to overcome this. The Cheese: There were a couple of cheese choices, but I went with American. The American cheese was properly melted. However, the cheese was lost in the saltiness and the juiciness of the burger patty. The Bun: The bun was a generic, non-seeded, barely toasted, standard burger bun. The bun was barely up to the task of containing the juicy beef. The bun was invisible on the palate. A properly hot griddle could have toasted the bun enough to provide some crunch. The Meat To Bun Ratio: A Mo Better Burgers, the beef was perilously close to dominating the flimsy bun. Still, the bun managed to do its job. The Fries: The fries were cut in house and were peel-on. Fat Bruce Lee noted that these were a better version of In 'N' Out fries. As usual, he was correct. Like In 'N' Out, the fries at Mo Better Burgers were not par-cooked. As a result, they ended up having that Styrofoam stick feel to them. Still the Mo Better Burgers take was heartier due to the peel. The Toppings: The shredded Romaine lettuce was fine and the tomato slices were red, juicy, and ripe. The Value: The burger value at Mo Better Burgers was average. $8.25 for a burger was a little steep considering the 5-ounce weight. Mo Better Burgers delivered a burger that was pretty much on par with the other neighborhood burgers...Umami Burger (the original location) and Rascal (Rascal, coincidentally, also over-seasoned their burgers). Parking was better at Mo Better Burgers, and the wait was shorter. That combination made Mo Better Burgers the cheeseburger of choice in that area. Burger Review : An average value for an above average and very juicy burger at Mo Better Burgers.